In 2017 there were 5,977 pedestrians and 783 bicyclists killed in crashes with motor vehicles in the United States. 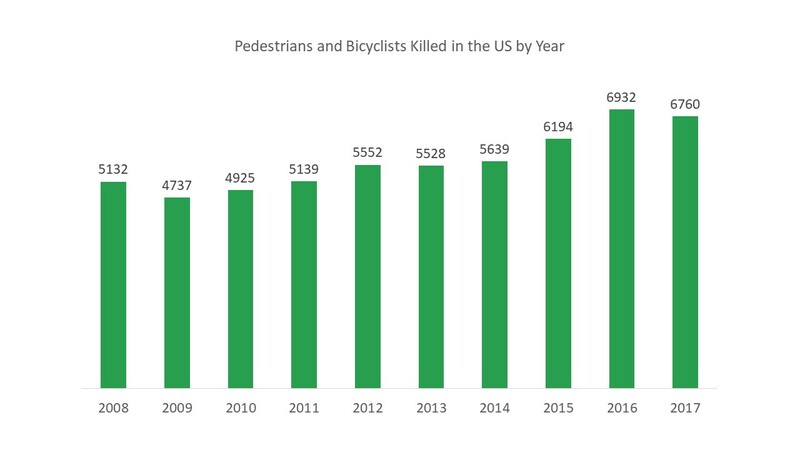 Together these vulnerable road users account for a growing share of total US traffic fatalities: in 2003, pedestrians and bicyclists represented 12.6 percent of total traffic fatalities, and in 2017 they accounted for 18.2 percent of fatalities. Pedestrian and bicyclist fatalities increased by 31 percent in the ten-year period between 2008 and 2017. During that same time period, total traffic fatalities decreased by 0.8 percent. At a national level, the majority of pedestrian fatalities (73 percent) and bicyclist fatalities (58 percent) occur at non-intersections. Lighting conditions are a major factor in pedestrian fatalities: three quarters of pedestrian fatalities nationwide occur in dark conditions. By contrast, 45 percent of bicyclist fatalities occur in dark conditions. Time of day plays a role in this as well. The hours from 6:00pm to 9:00pm tend to account for more pedestrian and bicyclist fatalities than other times of day. Though there is not an official accounting of total crashes involving pedestrians and bicyclists or injuries sustained by these road users at the national level, there are estimates each year from the Crash Report Sampling System (CRSS). Studies have shown that pedestrian and bicyclist fatalities represent only the “top of the iceberg” with respect to all crashes involving these modes. 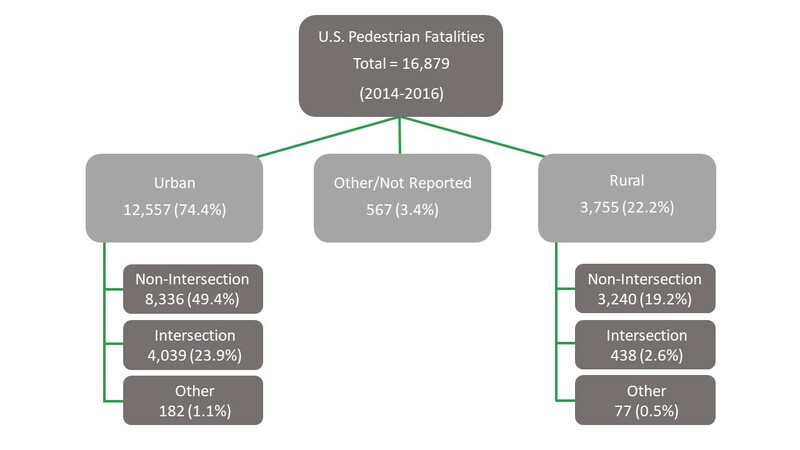 Furthermore, research has demonstrated consistent underreporting of crashes involving pedestrians and bicyclists, so as many as 55 percent of pedestrian crashes and even more bicyclist crashes may be missing from police-reported crash data. National data about traffic fatalities and other trends can be found in the Fatality Analysis Reporting System (FARS) Encyclopedia and periodic fact sheets published by the National Highway Traffic Safety Administration. Reach out to contacts in your State to learn more about data availability and trends in your area of the country.